Currently living in Belfast, Maine, I sing and play fiddle, banjo, and other instruments. My music is rooted in the music traditions of New England, Quebec, Ireland, Appalachia, Scotland, Brittany, and Scandinavia. I am available to play solo, with my duo partner Baron Collins-Hill in our band Velocipede, and in collaborations with other musicians. 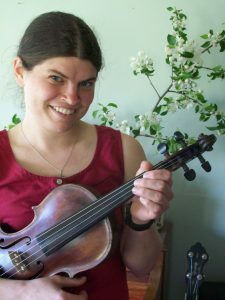 I give group and private lessons in Belfast and teach at Maine Fiddle Camp in Montville and The Acadia School of Traditional Music & Arts in Bar Harbor.